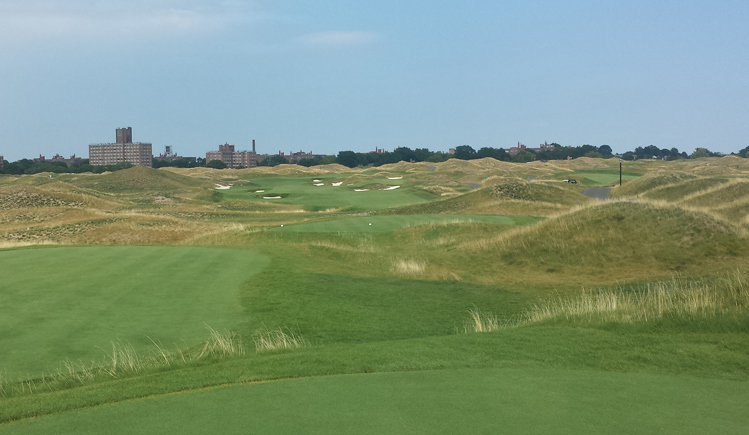 Trump Ferry Point Hole 2: This hole plays as a long par four or a short par five. I played it as a par five and it really isn't too tough when played that way, although back-right pins are really tough to get near. Trump Ferry Point Hole 4: The other par five on the front is pretty straight and has a raised green with trouble in the form of bunkers or steep slopes, as well as an undulating putting surface. 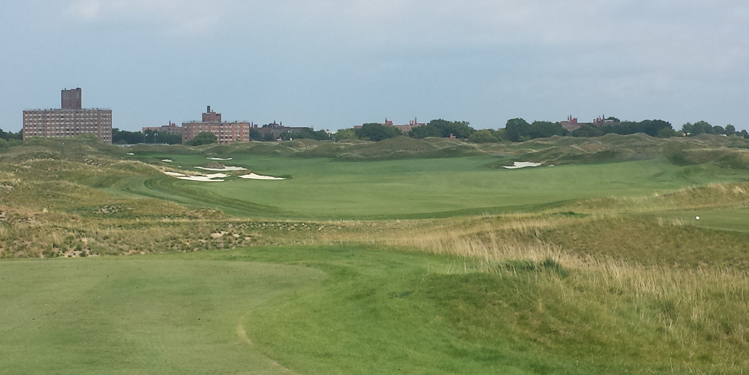 Trump Ferry Point Hole 6: This is a solid par four with a nasty little bunker in the middle of the fairway. It can be flown by a big drive but must be avoided at all costs. 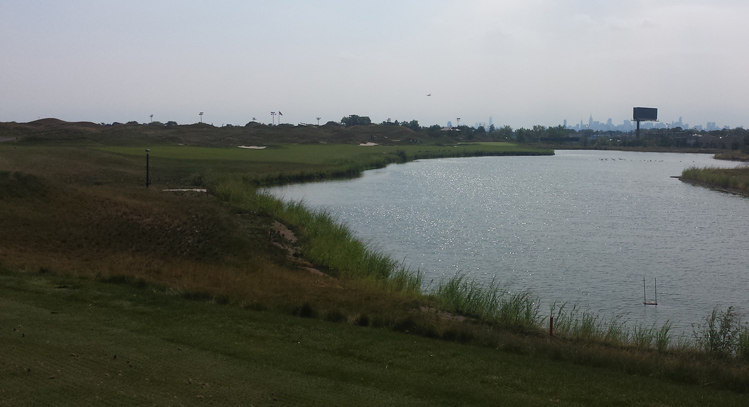 The farther the drive, the better the view of the green and the Manhattan skyline behind it. Trump Ferry Point Hole 7: This short par four is all about the water hazard. The safe drive, however, is still fairly tight between the water and the bunkers. Shots going too far left off the tee will be left with a very nasty angle back towards the water, and over the deep bunker at the front-left of the green. Trump Ferry Point Hole 9: The Whitestone bridge makes its first real appearance on this hole, which features a landing area riddled by bunkers. The green is wide and well-guarded as well. Trump Ferry Point Hole 10: The drive to start the back nine feels different that others on the course as it is a little uphill and the hole bends left behind the dunes, so getting a line of sight (other than the bunker that one does not want to be in) is a little tough. There are also hidden bunkers left around the dogleg, so cutting the corner is not as easy as it might seem. Trump Ferry Point Hole 11: The most bunker-laden drive is this one on a short par four. There are bunkers and ribbons of fairway strewn about with many options on how to play the hole. The green is elevated and small. Trump Ferry Point Hole 13: After the previous hole, it is a stark contrast to have no bunkers off the tee, but there is a lot of mounding, including one in the fairway. The approach is uphill and does indeed feature a massive sand trap in front of the green and a great view of Manhattan behind. Trump Ferry Point Hole 14: Another solid par four this one tempts the player to drive over the bunkers on the right to leave a shorter shot to the green, but there is heavy mounding over that way too..
Trump Ferry Point Hole 16: The drive on this hole is fairly unassuming with just the large bunkers to the left, but the hole then opens up on the second shot to reveal a really nice vista and a really tough approach shot..
Trump Ferry Point Hole 18: The finishing hole has yet another drive with a bunker in the middle of the fairway. However, for those that fly it, welcome to the temptation zone as the best angle to the green is from the left but there is nothing but hazard between the golfer and glory. Playing safe to the right is an option, but the third is not from an ideal angle. 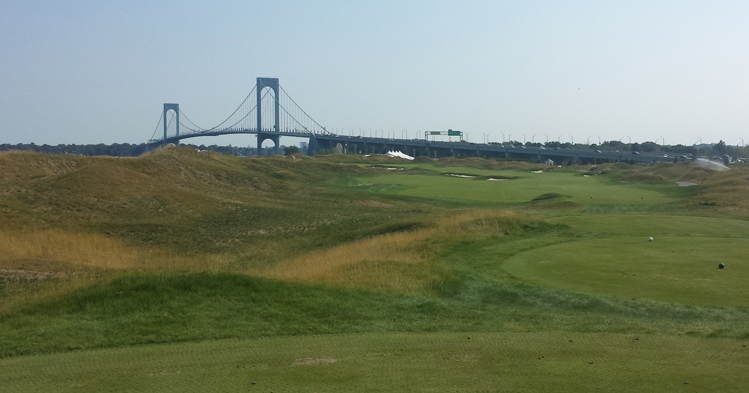 This is a great birdie/bogey type finishing par five with the Whitestone Bridge nearby.